Remaining in the Truth of Christ: Marriage and Communion in the Catholic Church is a collection of nine essays collected to help form a Catholic understanding of the issues under discussion at the Vatican Synod on the Family that will be held in October 2014. After a brief, introductory article by Robert Dodaro, O.S.A., President of the Patristic Institute, Paul Mankowski, S.J., scholar-in-residence at the Chicago-based Lumen Christi Institute, discusses “Dominical Teaching on Divorce and Remarriage: The Biblical Data,” in a detailed “bible study” of verses that illuminate the Christian understanding of marriage as indissoluble and exclusive. There is also a developed consideration of the Jesus’ observation that in marriage “the two” become one according to God’s creative will. “[T]he focus changes from man’s recognition of connaturality with the woman to the divinely designed purpose of the male-female duality. Jesus does not comment directly on the relation of the divorce commandment given by Moses to the will of God, but by explicitly connecting the marital becoming one flesh to the pristine order of creation, he is stating as emphatically as possible that the oneness of husband and wife is divine will and not a human contrivance.” (p. 46) This observation has implications for many contemporary questions besides the situation of divorced, “remarried” Catholics. The marriage practices of the early Church are examined by John M. Rist, emeritus professor of classics and philosophy at the University of Toronto and a former chair of philosophy at the Catholic University of America. His essay, “Divorce and Remarriage in the Early Church: Some Historical and Cultural Reflections,” is particularly essay in the light of Cardinal Kasper’s assumptions regarding the development of doctrine. Close examination of those few texts that might seem to offer exceptions –and Professor Rist gives them thorough scrutiny – brings him to conclude that “although among ancient Christians second marriages during the lifetime of a spouse were normally forbidden and those who were engaged in them were denied Communion, there were a very small but noticeable number of exceptions to the rule that, however, were almost invariably condemned.” (p. 92) There isn’t much in the ancient evidence to which those seeking change can appeal. The Orthodox perspective is provided by Archbishop Cyril Vasil, S.J., Secretary of the Congregation for Oriental Churches, who has written “Separation, Divorce, Dissolution of the Bond, and Remarriage: Theological and Practical Approaches of the Orthodox Churches.” This is an interesting essay in the light of Cardinal Kasper’s reference to Orthodox practice as a model the changes he would like to introduce. This brings Cardinal Brandmüller to ask, then, if “in the current situation and in the face of present pastoral difficulties” historical precedents permitting divorced people to remarry while the first spouse still lived might offer “a doctrinal position already taken in the past and from accepting a ‘more humane’ practice—as one would put it today—concerning divorce and remarriage?” Would this resolve our problems? He answers, “It is not for nothing that history has moved beyond [compromised practices of the past]—their theological legitimacy does not rest on solid foundations. Tradition in the technical-theological sense of the term is not an antiques fair where one can look for and acquire particular desired objects.” (p. 141) The inherent injustice of various idiosyncratic historical aberrations are precisely what led to the Church’s establishment of canon law norms. Gerhard Ludwig Cardinal Müller, Prefect of the Congregation for the Doctrine of the Faith, is the interviewee of another recent Ignatius publication The Hope of the Family: Dialogue with Gerhard Cardinal Müller. The Hope of the Family describes, in clear, simple terms, the controversies that will face the upcoming Synod on the Family and the Church’s position on some of them. Here, in an essay titled “Testimony to the Power of Grace: On the Indissolubility of Marriage and the Debate concerning the Civilly Remarried and the Sacraments,” Cardinal Müller picks up those themes and develops them. But, there is a larger pastoral concern at work here. 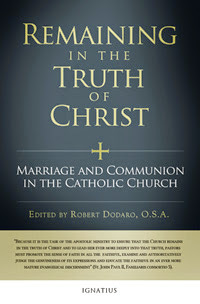 “[T]hey cannot be admitted to the Eucharist” because “their state and condition of life objectively contradict that union of love between Christ and the Church which is signified and effected by the Eucharist.” It would lead others “into error and confusion regarding the Church’s teaching about the indissolubility of marriage.”(p. 155) One might add, it would also lead remarried divorcées into a false understanding of their own situation. One particularly appreciates Cardinal Caffarra’s observation that speaking of a “second marriage” as though it “participates in an imperfect way in the ratio coniugii (the essence of what marriage is) is a serious offense against logic.” (p. 179) Secular language is inadequate for this discussion. Velasio Cardinal De Paolis, C.S., who is emeritus president of the Prefecture of Economic Affairs of the Holy See, authored “The Divorced and Civilly Remarried and the Sacraments of the Eucharist and Penance.” He details the Church position, which “is not a punitive or discriminatory rule against the divorced and the civilly remarried, but rather expresses an objective situation that makes impossible admission to the Eucharistic Communion per se” (p. 185) and explains its applicability to all the faithful. From this position, he examines Cardinal Kasper’s proposals for readmitting the civilly divorced and civilly remarried Catholic to Eucharistic communion. “I have tried to understand Kasper’s reasons. Inasmuch as I have been able to understand them, I do not find any valid argument to give an affirmative response to the question whether a penitential via media between laxity and rigorism can be found that would enable the divorced and civilly remarried to receive the sacraments of penance and the Eucharist.” (pp. 193-194) The bulk of Cardinal De Paolis’ essay, however, demonstrates that he understands the arguments all too well, and finds them well-intentioned, perhaps, but intellectually – and pastorally – wanting. This is the fundamental message that runs throughout the various essays here. People in difficult personal situations are not helped by wishing the situation away – by creating a “merciful” pretense. Among the many gifts the Church has to offer broken humanity is that she can see the individual’s place in a larger picture, that moves beyond transitory personal feelings and considers the welfare of all parties from a perspective that the individual rarely can. “Mercy” isn’t a band aid that covers the wound; it’s a salve that confronts the wound to achieve a salubrious end. The above excerpts are too brief to adequately convey the depth and scholarship of Remaining in the Truth of Christ. These qualities, however, render the volume indispensible to anyone who wishes to better appreciate the solid ground on which Church doctrine rests. For those interested in or requiring a more succinct explanation of Church teaching on the matter of divorce and “remarriage,” however, Gospel of the Family and The Hope of the Family (along with the auxiliary volume, On Human Life) may be more suitable. Spero columnist Stephanie Block is the author of the four-volume 'Change Agents: Alinskyian Organizing Among Religious Bodies', which is available at Amazon.